Many of you on facebook guessed it was a corn recipe from the picture. I agree it looked like that, but it's a different surprise for you. Hope you like it. Last week, one evening I was thinking what to make for dinner. So I checked the fridge and found brijal, capsicums and tomatoes. So decided to experiment and came up with this unique recipe. It turned out so yummy that I had to share with you all. Tell me how you like it. Heat oil in a skillet. Add mustard seeds, hing, curry leaves, turmeric powder, bay leaf and dried red chilli. 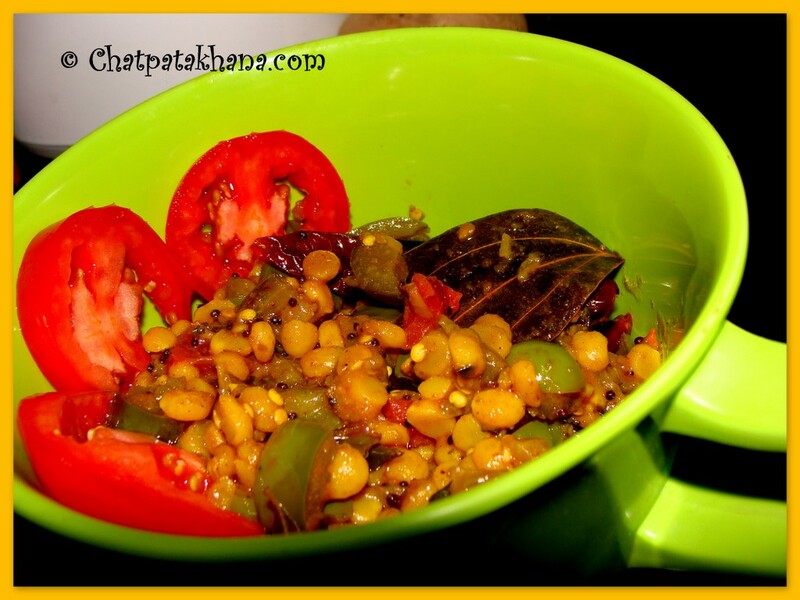 When mustard seeds crackle, add soaked chana dal, tomatoes and a little water. Cook with the lid covered for a few minutes till chana dal is tender. Now add the brijal,capsicum and the spinach leaves. Add the garam masala powder, aamchur powder and salt to taste. Add a little water and cook it with the lid covered. Once the brijal softens and the subji starts to leave oil, it is ready. Goes very well with parathas. You can add any other green leafy vegetables if spinach is not available. thanks for the receipe, it helps to make something different in this summer when you don't have any choice for vegetables.